A 54-year-old female presented to the general surgery outpatient office with acutely worsening “aching and burning” chronic abdominal pain. She had an extensive past medical and surgical history pertinent for chronic abdominal pain, gastroesophageal reflux disease (GERD), hiatal hernia, ventral incisional hernia status post Nissen fundoplication, and two revision fundoplication procedures with hiatal hernia repair with prosthetic mesh. Workup included a computed tomography (CT) exam of the abdomen and pelvis without intravenous contrast, which revealed erosion of the mesh through the gastric fundus (Figure 1). An EGD was scheduled for attempted endoscopic mesh removal, however, during the EGD, the protruding mesh could not be retrieved. 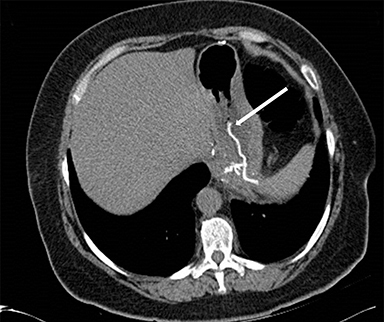 Post-procedural CT of the abdomen and pelvis with IV contrast was performed to exclude hemorrhage, and this CT revealed mesh protrusion into the distended gastric lumen (Figure 2). General surgery was then consulted. The patient was scheduled for nonemergent surgical resection of the mesh. In the interim, the patient developed gastric outlet obstruction symptoms, and had to be taken urgently to the operating room. Intraoperative EGD prior to skin incision revealed complete transmural migration of the mesh through the gastric wall. The mesh was impacted in the pylorus and easily retrieved endoscopically (Figure 3). Endoscopic evaluation of the gastric lumen revealed no evidence of perforation. Follow-up chest radiograph and fluoroscopic upper gastrointestinal series confirmed that the gastric wall was intact. The patient was discharged. Initial CT of the abdomen and pelvis without IV contrast showed diffuse inflammation at the level of the hiatal hernia repair with mesh. The prosthetic mesh was eroding through the gastric wall and partially protruding within the gastric lumen surrounded by gastric contents. No extraluminal air or fluid collection was present to suggest perforation or leakage of gastric contents into the peritoneum. CT of the abdomen and pelvis with IV contrast after the initial EGD demonstrated protrusion of the hiatal hernia mesh into the gastric lumen. The post-procedural air, acting as negative enteric contrast, delineated the true intraluminal nature of the mesh. In addition, there is soft tissue inflammation involving the gastric fundus, gastrosplenic ligament, and gastrohepatic ligament. There was no evidence of extraluminal air or fluid collection to suggest perforation and/or spillage of gastric contents. 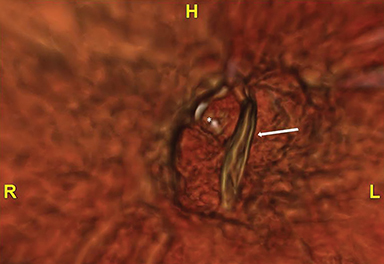 A three-dimensional reconstruction of the gastric lumen with field-of-view projecting towards the gastroesophageal junction exhibited intraluminal mesh with preservation of the lower esophageal sphincter. Intraoperative EGD images provided by the surgical team displayed the transmural progression of the entire mesh, which is lodged in the pylorus. Gastroesophageal Reflux Disease (GERD) is a common disease, affecting 18.1% to 27.8% of the population in the United States.1 More than 90% of patients with GERD have a hiatal hernia on radiologic imaging.2 While medical management remains a popular treatment choice, surgery has been found to be an effective alternative to medical therapy.3 Indications for surgical repair of a hiatal hernia include failing medical management, opting for surgery despite successful medical management, complications of GERD such as Barrett’s esophagus, or having extra-esophageal manifestations.4 A laparoscopic Nissen fundoplication, without or with mesh, is one of the mainstays of surgical management for hiatal hernia. Common complications include esophageal perforations, fibrosis, stenosis at the gastroesophageal junction, visceral erosion, and erosion of the mesh.5 Transluminal migration of the mesh into the gastric lumen is a rare complication, with approximately 10 cases found during our literature search. 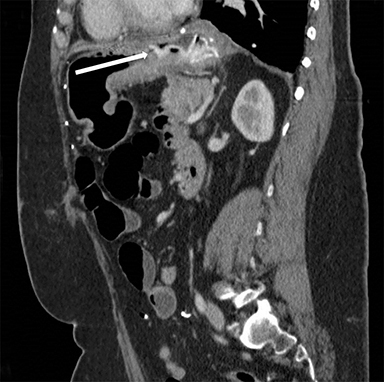 These patients with transluminal migration often present with dysphagia as their primary complaint, with chest pain and heart burn being the next most common symptoms.5 Removal of the intraluminal mesh with esophagogastroduodenoscopy (EGD) has been performed; however, several patients have required gastrectomy, esophagectomy, and/or open surgery to reverse the repair. This study highlights the possibility of complete transmural migration of mesh after multiple hiatal hernia repairs. Erosion of foreign objects placed around the hiatus has been a known complication for many decades. When the Angelchik prosthesis was first implemented over 30 years ago, gastric erosion was estimated to have occurred in 0.15 percent of procedures.6 After examining how often erosion of mesh occurs, one particular prospective trial found the incidence to be 0.49 percent. Transmural migration has rarely been cited in the literature; thus, there is no known incidence. Our report seems to be the first case report looking at transluminal migration of a mesh resulting in a gastric outlet obstruction. In reviewing the literature, three main types of repair mesh were used: biological, polytetrafluoroethylene, and polypropylene. Previous case series have shown erosion occurring with all three types.7 In studies showing transluminal migration, only polytetrafluoroethylene, polypropylene, and teflon have been reported. Unfortunately for our case report, the type of prosthetic mesh used is unknown. For patients with erosion of mesh, a surgical procedure was often required to remove the mesh. These procedures included mesh resection, esophagectomy, gastrectomy, or laparotomy for mesh resection.8 These procedures all have significant morbidity associated with them. For the case reports of transluminal migration, most could be removed by EGD, with one case requiring surgical intervention to remove the mesh off the gastric wall without perforation.9 Whether the mesh could have fully migrated into the gastric lumen and not required surgery is uncertain. 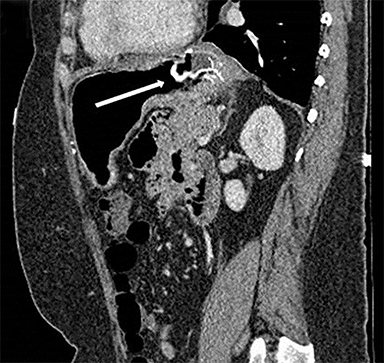 While mesh repair for hiatal hernia may be indicated for treatment of a symptomatic hiatal hernia, this case report highlights a lesser known and documented cause of morbidity may arising from a Nissen fundoplication using mesh. 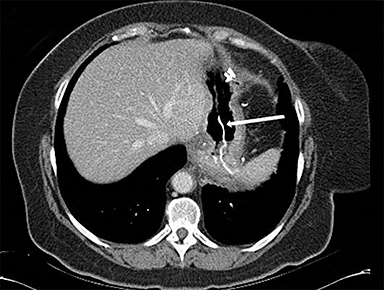 CT of the abdomen with contrast is a useful imaging modality for the possible diagnosis of transluminal mesh migration, and perhaps, the utilization of negative enteric contrast may aid in the diagnosis. El-serag HB, Sweet S, Winchester CC, Dent J. Update on the epidemiology of gastro-oesophageal reflux disease: a systematic review. Gut. 2014;63(6):871-880. Ott DJ, Gelfand DW, Chen YM, Wu WC, Munitz HA. Predictive relationship of hiatal hernia to reflux esophagitis. Gastrointest Radiol. 1985;10:317-320. Anvari M, Allen C, Marshall J, et al. A randomized controlled trial of laparoscopic nissen fundoplication versus proton pump inhibitors for treatment of patients with chronic gastroesophageal reflux disease: One-year follow-up. Surg Innov. 2006;13(4):238-249. Guidelines for Surgical Treatment of Gastroesophageal Reflux Disease (GERD). Stadlhuber RJ, Sherif AE, Mittal SK, et al. Mesh complications after prosthetic reinforcement of hiatal closure: A 28-case series. Surg Endosc. 2009;23(6):1219-1226. Kauten JR, Mansour KA. Complications of the Angelchik prosthesis in the management of gastroesophageal reflux. Am Surg. 1986;52(4):208-213. Soricelli E, Basso N, Genco A, Cipriano M. Long-term results of hiatal hernia mesh repair and antireflux laparoscopic surgery. Surg Endosc. 2009;23(11):2499-2504. Tatum RP, Shalhub S, Oelschlager BK, Pellegrini CA. Complications of PTFE mesh at the diaphragmatic hiatus. J Gastrointest Surg. 2008;12(5):953-957. Dutta S. Prosthetic esophageal erosion after mesh hiatoplasty in a child, removed by transabdominal endogastric surgery. J Pediatr Surg. 2007;42(1):252-256. Berg B, Cobb R, Panzer K, Powers B, Gupta S, Patel T. Complete gastric transmural migration of a prosthetic hiatal hernia. Appl Radiol. 2017;47(1):40-42. Prepared by Mr. Berg and Mr. Panzer while Medical Students at the Lewis Katz School of Medicine at Temple University, Philadelphia, Pa.; Dr. Cobb while a Resident PGY-3 and Dr. Gupta and Dr. Patel while Assistant Professors of Radiology in the Department of Diagnostic and Interventional Radiology at Temple University Hospital, Philadelphia, PA; Dr. Powers while a Fellow in the Department of Surgical Oncology at Moffitt Cancer Center, Tampa, FL.